Colombia. 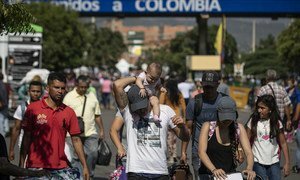 Venezuelan refugees and migrants cross the Simon Bolivar Bridge, one of 7 legal entry points on the Colombia-Venezuela border. 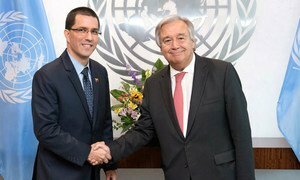 United Nations Secretary-General António Guterres met Jorge Arreaza, Foreign Minister of Venezuela on Friday, and reiterated that the UN acts in accordance with the humanitarian principles of neutrality, impartiality and independence, and will work with Venezuelan institutions, to assist people in need.